Blender, Boxcutters, Jigger, Skewers, Hurricane Glass. Puree in blender with ice, Everything but the Pineapple and the Cherries. 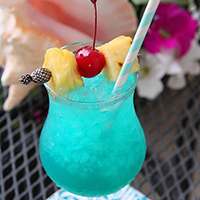 Pour into a glass Hurricane, add a skewer of Pineapple and Cherries. Serve.